David Archuleta's latest music video--Something 'Bout Love--beats Taylor Swift's "Mine" to capture lead on MYX Daily Top 10. I want bruno mars to take the no.1 spot on the myx daily top 10 like how he grab the no.1 spot on the billboard top 100! Congrats for David A. His album will come soon. SBL is a nice, catchy song. His other songs in the album are beautiful too. Watch his performance on MDA telethone, it’s a breathtaking performance. no. 12, Carrie won the Country music artst of the year award, pero si Taylor ang best seller ng country music.. 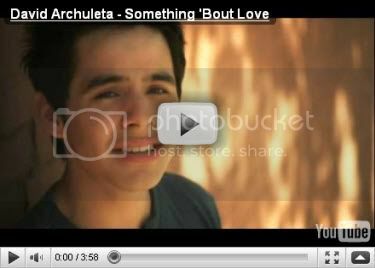 I love “Something Bout Love” by David Archuleta!!!!!! I thought the country music queen is CArrie Underwood? eh? ang pinakamaganda dyan ay ang just the way you are pati music video,pinoy pa si bruno mars,san kapa? sorry, kpop is now going down,,, Country Music Queen Taylor is back… 2NE1 may come but will not be welcome at the no. 1 spot. That’s what you think…. 2NE1 is coming….. Three new songs…. no way!! sa monday lang yan,, Taylor rocks! Sino sya??? no name recall!